They (we?) are selfish, noncommittal, and disrespectful. This all may be true or it might be totally ludicrous, and the latest in a string of older generations complaining about younger generations. At the end of the day, summer camp is built on millennials, and we have to figure out how to connect with, recruit, and lead this generation as our staff this summer. Depending how we define Millennials we might already be onto the next generation of staff. Could they be even worse? I kid of course. I was born in ‘88 and am a proud member of the millennial generation. But here’s the thing. Regardless of what we think, we need 18-25 year olds to make camp work, so instead of ringing our hands, let’s figure out how we can partner with them to make the best camp and help them. Now more than ever before, our potential staff have a choice in what they do this summer. They can volunteer in cool places, travel, get internships that might advance their careers, make a lot more money than we pay them, choose a different camp, come and work for us, and more. Unlike generations before, and even older millennials, the staff we are hiring this summer can get on Google and find an almost limitless number of options for how to spend their summer. If we want to recruit the best staff, we need to understand what they are looking for and build our staff recruitment AND the actual staffing experience to match their hopes. Below are the most common responses I hear from people about why they choose camp, in no particular order. For most of the staff we work with, they connect with each aspect in different ways. I could imagine building a quick quiz that would rank these for each applicant and spit out a simple diagram. Similar to the True Colors Personality Test. Some diagrams also below. Legacy - Connected to camp. Former Campers, parents were staff, that kind of thing. Impact - Belief in the mission. Want to be positive role models for kids, connect to nature, reimagine a different way of working with kids etc. 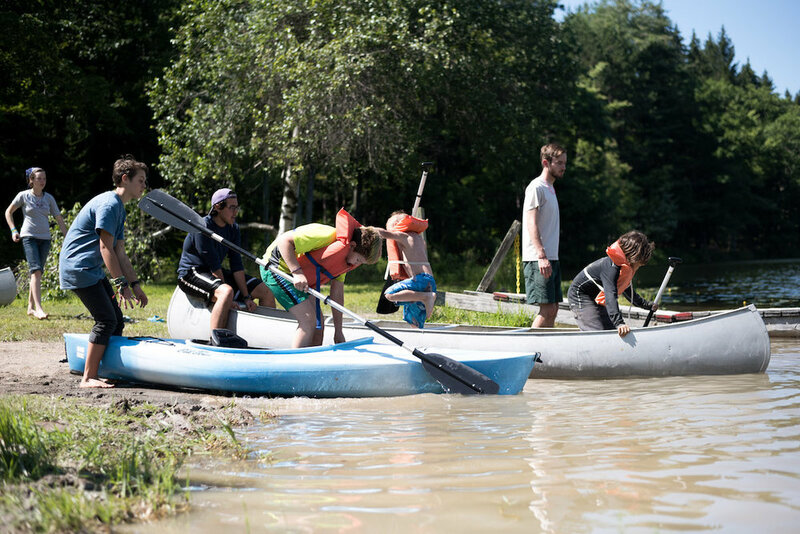 Community - Making new friends, connecting to old, being a camp counselor is all about the community. Career - How can camp help your career? New skills, 21st century skills, a network, a different experience. We are thinking long and hard at Stomping Ground about how we can be truly useful here. I think in the past we have only been mildly useful. Fun - For a lot of people it is a lot more fun to play by the lake than sit at a desk. But staff are often giving up things like concerts, family vacations, or summer parties. Money - It is a job. We don’t pay a lot at Stomping Ground ($275 a week for counselors 2018), but money is a part of the equation. Working at camp pays more than volunteering in cool places. Each potential staff member will be looking for these with different focuses depending on a million individual circumstances. By better understanding what they might be looking for we can individualize our recruiting messaging and their experience at camp. Great at some, not great yet, at others. At Stomping Ground, like most camps, we do a great job with fun, community, and impact. Where we lose people is around career advancement and the ability to make money. We, again like most camps, have a pretty limited budget. This summer we will pay our typical counselors $275 a week, up from $250 last year and $225 the year before. Next summer we will pay $300, not nearly enough to compete with the other jobs our staff could work, but inching up toward minimum wage. If we aren’t going to be able to compete based on short term financial returns, I think we need to be disproportionately good at long term career advancement so that we can make a good argument that giving up a couple summers of better pay results in a much higher long term upside. In many ways this argument is so that the staff, that already want to work for us, can convince their professors, parents, and advisors. This won’t be possible for everyone and that’s ok. If we can do this for the right people, we can create an unfair advantage because we actually genuinely care about each of our staff members. We are in the beginning stages of this, and are taking a two pronged approach. One - Helping our staff better understand themselves, what they want, and how to get there. This is means taking time out of staff orientation to focus on them. To run workshops about professional development, career skills, and resume building. For specific staff we try to help them gain the skills they want if those skills also can help camp. Two - Leveraging our network -- to connect current and former staff with the right mentors. This is the Kookie Idea. At camp we have a huge number of people that care about what we do, camper parents, alumni, donors. They already love camp, most want to help but don’t know how. Many are very successful in their fields. Our newest endeavor at Stomping Ground is what we are calling the Stomping Ground Support Network, you could call it the alumni network, but we don’t have many alumni yet. Basically, we built a quick online form for people to fill out saying the would talk with staff members interested in learning more about their industry. The next step is learning from our staff this summer what they are looking for and connecting the right mentor with the right staff member. We will also probably send an email with all our staffs’, who are looking for jobs, resumes to this group in September. I love getting to build a staff community, recruit the best people, and lead a group of passionate summer staff each year. It is one of my favorite parts of running camp. As camp directors we get to choose how we do that, and I hope I can keep choosing to try and find new and different ways to bring value to our community both because it helps in recruiting and because it helps the people we care the most about. I would love to hear in the comments some different ways you are bringing value to your staff. THANK YOU! Have a great summer. It's Good to Be Together!